Below is our 11 stage repair process, this will give you an idea as to how the whole crash repair process works and how we handle your needs from the minute your vehicle arrives to the minute you collect it. Your vehicle will either be collected/delivered by a Recovery Agent in the event that the vehicle is non-driveable. Once your vehicle arrives on site all details are logged in with Administration Office. Subject to your Motor Policy, a Courtesy car will be supplied, and one of our office staff will explain all details to you at the time. One of our fully qualified engineers will accurately assess the damage on your vehicle on a computerised estimating system. They will then contact you to give a full explanation of the repairs being carried out, and of course answer any questions that you may have regarding your vehicle. On all AVIVA / RSA/Travelers/MIS cases we are authorised to start repairs to your vehicle immediately, with your consent. If your vehicle is insured by another insurance company, we will seek authorisation to commence repairs accordingly. Parts are immediately confirmed and ordered. Your car will then be colour coded into our workshop priority loading system to ensure that the repair will be completed in the shortest possible time. Any parts associated with the repair to your vehicle will be removed and dismantled by a fully qualified technician, and should any further damage be found, this will be assessed, and any additional parts required will be ordered and approval requested from the Insurer. Desktop imaging is the most modern way for Assessor inspections and most are done this way, ensuring, quick and detailed approval. We estimate the repair costs, and upload this with photos and all the administration details required. The Insurance in house Assessor will review the claim and approve the work very quickly, thereby minimizing the vehicles’ off road time. If further approval is required from your insurance company, we will arrange this as quickly and efficiently as possible. We currently work with the majority of the major insurance companies. Once the affected areas have been dismantled, your car will move in to our panel department. Extensively damaged vehicles will be loaded on to our state of the art body jigs and any misaligned chassis will be realigned to the manufacturer’s specification. Any new panels will be fitted and checked for correct alignment and all panels requiring repair will be finished to the highest standards, going through our quality control processes and being signed off by a technician before proceeding to our paint department. Once into the paint department your vehicle will be prepared for painting, and refinished in the recommended materials. All colours are accurately mixed on site using state of the art equipment, enabling us to exactly match the existing colour of your car, and refinish to the very highest standards. All new and reusable parts are refitted and checked for operation and alignment, and any manufacturer recommended resets are carried out. A series of checks will then take place relative to the repair- for example – lights, fluid levels, wheel torques, tyre pressures, etc, to ensure that all the work carried out meets our strict quality requirements. Each and every stage is thoroughly checked by a fully qualified technician and only when they are completely satisfied will your car progress to the next stage of repair. This ensures that the highest quality standards are maintained throughout the whole repair process. 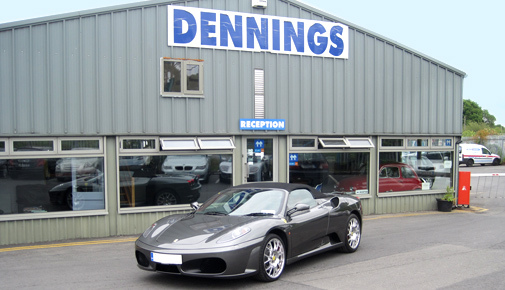 Once repairs to your vehicle are complete, we will contact you to arrange delivery or collection of your vehicle. Whether you are at home at work or you would prefer to come in – one of our customer service representatives will be more than happy to assist in returning your vehicle to you and answer any questions that you may have. I would like to convey my gratitude for the way in which you and your team dealt with me and my husband following my accident. The concern and interest you showed in our situation was very much appreciated and we were delighted with your service and the quality of the repair to our car.